Recently I bought a new 5:4 BenQ BL702A TN LED monitor that has a rumor to support the 15KHz native Amiga horizontal frequency. Before that I bought a 24″ IPS WideScreen Philips that also supported 15KHz but since Im not a big fan of black border I sold it to a friend instead. When I did my previous tests I used a 23 to 15 (Amiga RGB to VGA) D-Sub converter between the A1200 and the monitor. To be able to skip one extra connection/joint I decided to do my own 23-15 D-Sub cable. There are many schematics out there but after some research I made the following one. The result was very good. Minor distortions caused by the previous adapter was completely gone and now I have a cable that I can use directly. The review of the BenQ monitor will be done later when I have found a proper cam that can record with high quality. Confirmed to work with a DELL 2001FP LCD monitor (dated April 2005). Thanks for sharing! Why some people use the chip 74LS08N ? 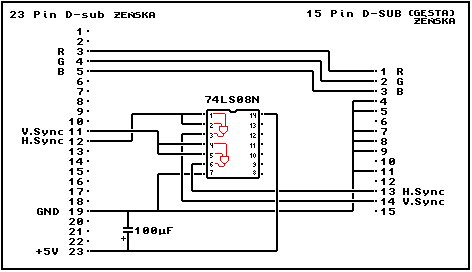 what are the difference from this one respect your schematic ? The difference is that I use Horizontal and Vertical sync instead of Composite Sync. The schematics I’ve found shows this https://www.ikod.se/wp-content/uploads/2017/11/74LS8N.png. I tried your schematic and was able to see some output on my Dell U2410! (but suddenly not in a good quality -> works only partly with PAL Hi Res (not laced)! Odd, has it worked before and is the Dell U2410 100% 15Khz compatible? Some monitors also requires buffering which this cable does not have. 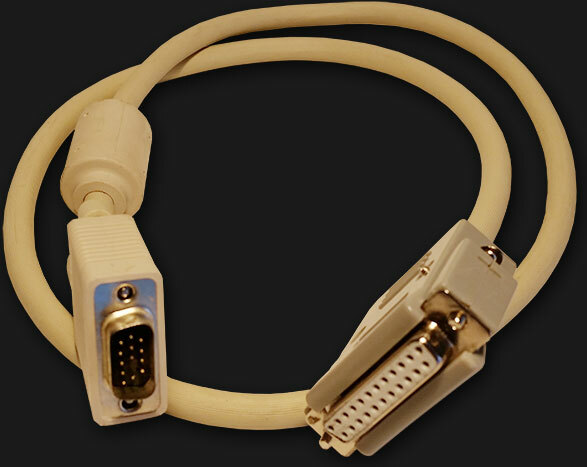 For order this cable rgb to vga Amiga? I do not sell this cable. But I can recommend amibay for it, I know there is a few who sells this cable there.